For the 1980s NSW and Transvaal player, see Steve Smith (cricketer, born 1961). Steven Peter Devereux Smith (born 2 June 1989) is an Australian international cricketer and former captain of the Australian national team. On 30 December 2017, he reached a Test batting rating of 947, the second-highest of all time, only behind Don Bradman's 961. He was ranked top Test batsman in the world in 2015, 2016 and 2017, according to the ICC Player Rankings. Smith is often regarded as one of the best batsmen in the world and considered the "best since Bradman" due to his high batting average. He played for New South Wales and Sydney Sixers in domestic cricket. Although he was initially selected for Australia as a right-arm leg spinner, Smith later played primarily as a batsman. After a few matches in 2010 and 2011, he was a regular player in the Australian team after 2013, and took over captaincy from Michael Clarke in late 2015, after which he predominantly batted at number 3 or 4. Awards he has won include the Sir Garfield Sobers Trophy (ICC Cricketer of the Year) in 2015; ICC Test Player of the Year in 2015, 2017; the Allan Border Medal for the best player in Australian Cricket in 2015, 2018; Australian Test Player of the Year: 2015, 2018 and Australian One Day International Player of the Year: 2015. He was named by Wisden as one of their Cricketers of the Year for 2015. In 2014, Martin Crowe described Smith as one of the young Fab Four of Test cricket along with Joe Root, Kane Williamson and Virat Kohli. In March 2018, Smith was widely criticised for overseeing ball tampering in the third Test against South Africa, during which he stood down from the team captaincy and was replaced by Tim Paine. Following an investigation by Cricket Australia, Smith was banned from all international cricket and domestic cricket in Australia for one year, and will not be considered for a leadership role for another year after that. Steve Smith was born on 2 June 1989 in Kogarah, Sydney to an Australian father, Peter, who has a degree in chemistry, and an English mother, Gillian. Smith attended Menai High School, and left at age 17 to play cricket in England where he played club cricket for Sevenoaks Vine in the premier division of the Kent Cricket League. He did so well for Sevenoaks that he was picked to play for Surrey's second XI. Because his mother was born in London, Smith has dual British and Australian citizenship. In 2011, Smith started dating Dani Willis, a commerce and law student at Macquarie University. In June 2017, the couple announced their engagement while on holiday in New York. The couple married at Berrima, New South Wales on 15 September 2018. Smith was a member of the Australian team at the 2008 Under-19 Cricket World Cup in Malaysia. In the tournament he scored 114 runs and took seven wickets in four matches. Smith made his first-class debut for New South Wales against Western Australia at the SCG on 24 January 2008. He scored 33 in his only innings as NSW defeated WA outright. He was part of the New South Wales team that won the 2009 Twenty20 Champions League. In the final against Trinidad and Tobago at Hyderabad, Smith made 33 with the bat and took two wickets. By the end of the 2009–10 domestic season, Smith had a first-class batting average of over 50 after 13 first-class matches. While his first-class bowling average in the high forties was not as impressive, his bowling appeared to be steadily improving following some well-publicised mentoring and praise from Shane Warne. In the final match of the season he took 7 for 64 in the second innings against South Australia. 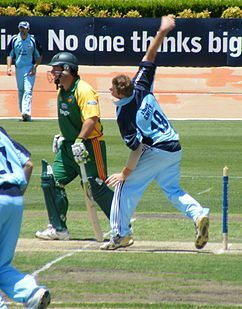 Smith made his Twenty20 cricket debut for New South Wales in a match against South Australia at Adelaide on 1 January 2008 during the six team KFC Big Bash competition. Smith was the leading wicket taker at the 2008 Big Bash tournament. He took 4/15 against Queensland and finished with 9 wickets overall. He was also named the second-best player of the tournament. In 2011–12, the Australian T20 competition became the city-based Big Bash League featuring eight teams. Smith joined the Sydney Sixers and filled in as captain when Brad Haddin could not play due to Test duties, subsequently leading the team to victory in the inaugural season. As an all-rounder, he scored 166 runs with the bat from nine matches with a strike rate of 130.71, including one half century. With the ball, he took 6 wickets at an economy rate of 8.06 per over. He also took nine catches throughout the tournament. In the final match, the Sixers beat Perth Scorchers by 7 wickets while chasing down the target of 157 within 18.5 overs after the Scorchers made 5/156 in 20 overs. Smith's good form during the Big Bash League, attracted the attention of former India Captain Sourav Ganguly, and was recruited to play for the Pune Warriors India team captained by Sourav Ganguly in the 2012 Indian Premier League. Smith had also been made captain of the team in one match, when Ganguly was rested, despite Australian captain Michael Clarke being the vice-captain. He continued to play for the same franchise in 2013, under the captaincy of Angelo Mathews. Smith was first bought by Royal Challengers Bangalore for the 2010 Indian Premier League as a replacement for Jesse Ryder. During the 2011 IPL player auction, he was bought by Kochi Tuskers Kerala for $200,000, but he had to have an ankle operation and was not available to play for them that season. The next season, Kochi Tuskers were dropped from the IPL and Smith was put up for auction. He went unsold at the 2012 IPL Players Auction, but was later bought as a replacement for Mitchell Marsh by the Pune Warriors India. In his first match for his new team, he scored 39 runs off 32 balls to lead his team to victory against the Mumbai Indians. He received the Man of the Match award for this effort. In the auction for IPL 2014, Smith was bought by Rajasthan Royals for $600,000. Smith was given the captaincy of the Royals in the latter half of the 2015 season and led the team to significant victories, thus ensuring a berth for his team in the play-off part of the tournament. During the 2016 IPL Auction, Smith was bought by new franchise, the Rising Pune Supergiants for the same price as in the previous auction ($600,000), and struggled early for form. Smith finally broke a run of low scores against Sunrisers Hyderabad, scoring 46*. His form continued as he registered his maiden T20 century against the Gujarat Lions, scoring 101 off 54 balls. He then went on to score a further 45 against the Mumbai Indians, before being ruled out of the remainder of the tournament with a wrist injury. The Supergiant management axed MS Dhoni as captain and named Smith as captain for the 2017 season. In RPS's first game against Mumbai Indians, Smith led his team to victory in style, scoring 84* and was rewarded with the Man of The Match award. Three consecutive losses, however, left his team in last position on the points table. A run of 8 wins in 10 matches helped Supergiant finish in the second position, and thus qualify for the playoffs, with Smith receiving praise for his captaincy from renowned cricketers and experts like Sunil Gavaskar and Kevin Pietersen. He led his team to the final with a 20-run victory over Mumbai Indians in Qualifier 1. In the final Smith's men faced Mumbai yet again. He scored 51 off 50 balls but could not lead RPS to victory. Pune lost the match by one run. Smith was RPS's highest run scorer in the tournament, scoring 472 runs at an average of 39.33, including three fifties. In February 2018, he was named as captain of Rajasthan Royals for the upcoming IPL 2018. However, following his admission of involvement in the Australian test side's ball tampering controversy in the Third Test in South Africa in March 2018, it was announced by the team that Smith has stood down from that role and Ajinkya Rahane took charge as the new captain for Rajasthan Royals team. On 28 March 2018, after being banned by Cricket Australia for his involvement in a ball tampering incident, Smith's player contract with the Royals was terminated by the Board of Control for Cricket in India as Steve Smith and fellow Australian batsman David Warner were banned from playing for their respective teams for the upcoming 2018 IPL edition. In November 2018, Smith was retained by Rajasthan Royals for the 2019 Indian Premier League. After losing six out of first eight matches of the season, Smith was appointed as the captain of the Rajasthan Royals by replacing Ajinkya Rahane. In May 2018, Smith was named as one of the ten marquee players for the first edition of the Global T20 Canada cricket tournament. On 3 June 2018, he was selected to play for the Toronto Nationals in the players' draft for the inaugural edition of the tournament. In his first representative match since his conviction for ball-tampering, Smith scored 61 runs from 41 balls alongside Anton Devcich as the Toronto Nationals won by six wickets against the Vancouver Knights. In the tournament he scored 167 runs in six matches at an average of 33.40, including two fifties. In July 2018, Smith was named in Barbados Tridents's squad in the sixth edition of Caribbean Premier League. In September 2018, Smith returned to Australian club cricket by scoring 85 off 91 balls for Sutherland in a one-day match against Mosman. In October 2018, he was named as one of the fourteen Platinum category players for the fourth edition of the Pakistan Super League. In December 2018, Smith was named in Comilla Victorians's squad in the sixth edition of Bangladesh Premier League. He played only two matches of the tournament before returning to Australia for elbow surgery. Steve Smith made his international cricket debut in a Twenty20 International match playing as a leg spinner against Pakistan at Melbourne in February 2010. The same month, he made his One Day International debut against the West Indies also at Melbourne, playing in the fifth match of the series. In the 2010 ICC World Twenty20 competition held in the West Indies, Australia finished runners up to England. Smith took 11 wickets in seven matches at an average of 14.81 to finish as the equal-second-highest wicket-taker of the tournament. Smith made his Test debut at Lords in July 2010, playing both Tests against Pakistan in the 2010 Test series played in England. He was selected mainly for his bowling, and batted down the order, although his bowling was not required in the first innings. In the second innings, he took 3 wickets for 51 as Australia won by 150 runs. In the second Test he was called to bowl only ten overs and took no wickets, although he played an impressive role with the bat in the second innings. Batting with the tail, he scored 77 including nine fours and two sixes off successive balls, helping Australia to set a competitive target after having been bowled out for 88 in the first innings. Smith's fielding attracted attention during the 2009–10 season with some spectacular catches in the outfield. 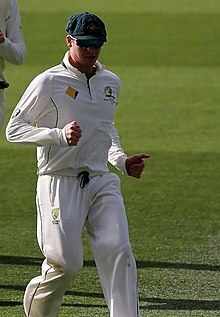 In the 2010–11 Australian summer, Smith played three Tests in the 2010–11 Ashes series, this time playing more as a batsman, taking the number six spot in the order. His performances were solid during the series, getting a number of starts and scoring two half centuries. Following the 2010–11 Ashes, Smith did not play another Test for two years, his next Test series coming against India in March 2013. Smith's return to the test team came during the 2013 tour of India. In the previous two Sheffield seasons his form had been good without being great (averaging 37), but he was chosen for the 17-man squad, primarily as a backup batsman, rather than an allrounder as he had been in the test team previously. Smith was chosen for the third test in Mohali, his first in over two years, when four players were dropped for "not doing their homework". In his first match innings in India he scored 92 before being stumped by Dhoni from a delivery by Pragyan Ojha, and in the second innings he later scored 5 runs. In the final Test match at Delhi, Smith made 46 and 18 runs, respectively, but was unable to win the Test match as India secured a 4–0 win against Australia. Following Australia's 4–0 defeat in India, Australia's next series was against England in the British Isles in July. Although the squad for the 2013 Ashes were finalised in April, Smith was the vice-captain of Australia's A team and was later called into the main squad after showing some promise in the Australia's A tour to the United Kingdom in June where he made 133 runs against Ireland in Belfast but also as a backup batsman due to Michael Clarke's fitness concerns. He played his first-class tour match with the main squad on 2 July 2013 in Worcester making 111 runs in both innings combined. In the first Test match at Trent Bridge he made a half century in his first innings but fell cheaply in the second innings getting out lbw by Graeme Swann. While making little impact at Lord's, Smith produced a century at Hove against Sussex on 27 July. In the third Test being 2–0 down to England, Australia moved up north to Old Trafford Cricket Ground in Manchester needing to win or draw to save the series. Smith made 89 and 19 runs, respectively, but the third Test match stirred controversy about the on-field umpire's decisions and DRS (Decision Review System) causing Smith to survive in two occasions and his teammate Usman Khawaja to be dismissed. In the final Test, Smith scored his maiden Test century, which he achieved in the first innings of the last Test of the series at The Oval, reaching the total in style by hitting a six off the bowling of Jonathan Trott. He became only the sixth Australian to reach his maiden Test 100 with a six. At the end of the series, the urn was retained by England after winning the series 3–0. Smith played in all five tests, scoring 345 runs at an average of 38.33. Smith was called in the Ashes XI squad for the first Test of 2013–14 Ashes series in Brisbane. Despite a slow start in the first and second Test, Smith produced his first Test century on home soil in the third Test at Perth helping Australia display a total of 6–326 at stumps on the second day to later win the Test match and be awarded man of the match. In the fourth Test he was dismissed at 19 by Stuart Broad but later on made another century in the final Test at the SCG, alongside with the partnership with Brad Haddin, helping Australia come back from 5–97 to 326 all out in the first innings and went on to win the Test match by 281 runs. The victory in Sydney marked a 5–0 whitewash victory towards Australia after a dismal 3–0 loss during the winter period of 2013. Steve Smith made two centuries and produced 327 runs at an average of 36. Smith played just one ODI match during England's tour during 2013–14, in the 4th ODI at Perth where he made only 19 runs. Following a 5–0 victory against England in the Ashes, Australia were scheduled three Test matches and three T20 matches in South Africa. In the first test at Centurion, Johannesburg, Smith made his fourth century and first in South Africa, where he and Shaun Marsh made a 233 run partnership from 4–98. Australia won the test by 281 runs. The second Test in Port Elizabeth saw a slower pitch as Smith made 49 and a duck and South Africa levelled the series 1–1. In the deciding Test match in Cape Town, Smith made 89 runs in the first innings and finished 36 not out in the second innings as Australia won the series 2–1. Steve Smith produced 269 runs at an average of 67.55, the third-best in the series and the second-best by an Australian, second to David Warner. The five-month break from cricket activity saw a surprise pick of Smith called up for the 2014 Zimbabwe Tri-Series on the August 2014. Smith prior to the tour had two ODI matches in the last two years. In his first match against Zimbabwe, he was run out by Sikandar Raza. He made scores in his thirties in his participating matches but only made 10 runs in the final against South Africa on 6 September, where South Africa went on to win the Tri-Series. The squad later travelled to the UAE to face Pakistan in a T20 Match, three ODIs and two Tests. In the first and only T20 match, Smith made three runs before being dismissed and later won the single T20 match. Following the T20 matchup was 3 ODIs. In the first ODI at Sharjah Cricket Stadium, Smith made his first ODI century scoring 101 runs off 118 balls to push the visitors to a 1–0 lead in the series. In the second ODI he made 12 runs and in the third and final ODI he made 77 runs off 105 balls to win the ODI match by 1 run. However, during the match, Steve Smith's catch on Fawad Alam questioned whether his catch was within the ICC laws. The incident occurred when in the 18th over of Pakistan's chase of 231 where Xavier Doherty delivered the ball and before Fawad made contact with his paddle sweep, Smith had moved from first slip towards leg slip to intercept the shot. The legality of the catch continued to be the main talking point after the ODI Series and afterwards ICC made a press statement stating that: "As long as the movement of a close catching fielder is in response to the striker’s actions (the shot he/she is about to play or shaping to play), then movement is permitted before the ball reaches the striker. On the day, if umpires believe any form of significant movement is unfair (in an attempt to deceive the batsman), then the Law still applies." The win saw Australia rise back to number one in the ICC ODI Rankings and Steve Smith was made man of the series for his batting performances. Transitioning into the Test series saw Australia's continued failure against reverse swing and spin in the subcontinent. In the warm-up match against Pakistan A in Sharjah, Australia lost by 153 runs where Smith made 58 but retired out. In the first Test match in Dubai, Smith made 22 runs in the first innings and 55 runs in the second innings but collectively lost the Test match by 221 runs. In the second Test, Smith made a duck and 97 runs but Australia's woes against spin continues as Australia lose by 356 runs. In the series he made 174 runs at an average of 43.5 runs. Arriving back from the subcontinent following their 2–0 Test defeat against Pakistan. Smith played 4 ODI out of 5 series against South Africa where Australia defeated South Africa 4–1 in the ODI Series. He missed the first match due to selectors picking Shane Watson over Smith but later joined the remainder of the games due to Michael Clarke's hamstring injury. In his first match in Perth he registered 10 runs but in the continuing games he made: 73, 104 and 67 runs. Smith scored his first century on Australian soil in the 4th ODI at the MCG. Smith scored 254 runs, the highest Australian total in the series and received the man of the series award. India arrived in Australia to play a tour Test match series and a tri-series ODI competition with England. The ODI Series began after the four Test series, preceding the 2015 Cricket World Cup. The Test series was played first and the first Test match was scheduled on 4 December in Brisbane, but was later postponed because of the death of Phillip Hughes. The first Test was later rescheduled to the Adelaide Oval on 9 December and Brisbane would be hosting the second Test on 17 December. In the first Test match in Adelaide, the Australian players wore Hughes' Test cap number 408 on their playing shirts for the match as well as black armbands in honour of their former teammate. In the first Test match in Adelaide, Smith scored 162 runs in 298 balls in the first innings and made 53 runs in the second innings, defeating India by 48 runs into day five. This also marked Steve Smith's first Test century against India and at the Adelaide Oval. On 15 December, Smith was named Australia's new vice-captain and following an injury to Michael Clarke, he was appointed stand-in skipper against India with Brad Haddin as his deputy. He made his captaincy debut for Australia in the Second Test match against India at the Gabba. He continued his batting form and made 133 runs in the first innings before being run-out in the second innings with a score of 28. Steve was made man of the match and Australia were 2–0 in the series, defeating India by 4 wickets. In the third Test at the Melbourne Cricket Ground, Smith made his third consecutive century in the first innings of the Test match scoring 192 runs in 433 balls. He also scored his 1,000th run in the 2014 calendar year, and became the eighth-fastest Australian to reach 2000 Test runs, beating previous Australian captains such as Michael Clarke and Ricky Ponting. The final Test match at the Sydney Cricket Ground saw Smith in his fourth consecutive century against India. The achievement marked Steven Smith joined Don Bradman (6), Neil Harvey, Jack Fingleton and Matthew Hayden (4 each) as Australian centurions in four or more consecutive Tests, a streak Smith started during the 1st Test at Adelaide. Smith also became the first Australian skipper to open their captaincy with three consecutive centuries, and the second batsman since Jacques Kallis against West Indies to score a century in every match of a Test series. The Test match ended in a draw as Australia defeated India 2–0 in the series, thus returning the Border–Gavaskar Trophy to Australia. The conclusion of the Test series saw Steven Smith man of the series, but also scoring 769 runs at an average of 128.16, the highest aggregate score in a four-test match series in Australia and also marked the highest number of runs scored against India by an Australian, surpassing Donald Bradman. Following the Test series, an ODI tri-series with India and England was confirmed in preparation for the upcoming Cricket World Cup hosted by Australia and New Zealand. In his first ODI match against England in Sydney, he was dismissed at 37 runs by Moeen Ali but continued to provide runs in the following matches leading to the final against England. En route to the tri-series final, Smith was handed his first ODI match on 20 January as the skipper after George Bailey was suspended for a slow-over rate earlier in the series. Three days later, Smith scored his first ODI century against England producing 102 runs in 95 balls; the win saw Australia qualify for the final and later defeating England to win the Carlton Mid Triangular Series in Australia 2014–15. In the World Cup, Smith played a vital role as versatile batsman as he played in numerous batting positions from number three down to as a middle-order batsman. In his maiden World Cup game, he was dismissed early on 5 against England in the group stages, but later improved as the tournament progressed. After making half centuries against Afghanistan, Sri Lanka and Pakistan, he later steered Australia into the final after making a century against India in the semi-finals at the Sydney Cricket Ground. In the final, Australia drew against fellow neighbours, New Zealand after defeating South Africa. Australia's target to chase 183 runs after a New Zealand collapse saw Steve Smith score 58 not out alongside the skipper, Michael Clarke as Australia won by 7 wickets with 101 balls remaining. Smith was Australia's highest run scorer in the tournament, scoring 402 runs at an average of 67, including a century and four fifties. After winning the World Cup in March, Australia's winter schedule was later released with the Test team returned from their short break towards their two Test series against the West Indies in the Caribbean. Due to IPL commitments, Smith missed out on Australia's maiden warm up match against the West Indies Cricket Board President's XI on the 27th May. He later joined the Test squad in the first Test match in Windsor Park, and scored 25 and 5 runs, respectively. In the second Test match in Sabina Park, Steve steered Australia to a first innings score of 399, where he made 199 and became the eighth man in Test history to be dismissed on 199. Australia later won the match in positive fashion, beating the West Indies by 277 runs within four days and retained the Frank Worrell Trophy. After his man of the match effort against the West Indies in the second Test, Smith became the second-youngest player ever to reach the number 1 ICC Test batsmen ranking and just the eighth Australian to do so. The 2–0 victory against the West Indies gave Australia some momentum into the long waited Ashes series in the British Isles. While Australia's last tour in the British Isles was in 2013, the emergence of England's Joe Root and Australia's Steve Smith saw an awaited clash to determine the better batsman in the upcoming series. With the Australians on good form and England drawing to New Zealand and West Indies gave Australia some confidence to the countdown to the first Test in Cardiff. Steve started positively in his first-class match with a century against Kent in Canterbury. He was rested on the second first-class match and in the first Test match in Cardiff, Smith made 33 in both innings as England took a 1–0 lead in the series. In the second Test in Lord's, Smith produced 215 runs in his first innings, his highest Test score and became the first Australian to score a double-ton at Lord's since the Second World War. His double century also made Smith pass 3000 Test runs, the third-youngest Australia to reach the feat. In his second innings he made 58 runs before Australia levelled the series in a 405 run rout. In the third Test in Edgbaston, Smith made 7 and 8 runs, respectively, both dismissed by Steve Finn, but Smith's low scores saw England take a 2–1 lead into the series. In the fourth Test in Trent Bridge, Australia needed a win to draw the series. With overcast conditions and a green top, Alistair Cook won the toss and elected to field. In the first innings, Smith was dismissed again cheaply by Stuart Broad with a score of 6, as Australia capitulated in the first session of a total 60 runs from 18.3 overs—is the quickest—in terms of balls faced—a team has been bowled out in the first innings of a Test match. In the second innings, Smith was again caught by Ben Stokes in the slips from Stuart Broad with a meagre score of 5. England within three days regained the Ashes and took an unassailable 3–1 lead and critics began to question Smith's performances in seaming conditions. Into the fifth and final Test match back at The Oval, Smith made his second century in the series registering 143 runs off 252 balls before being bowled by Steve Finn. Australia later defeated England by an innings and 46 runs. However, England regained the Ashes 3–2 after winning in Nottingham in early August and later saw the Test retirements of Australia's senior players: Michael Clarke, Chris Rogers and later Shane Watson, Ryan Harris and Brad Haddin. Smith made 508 runs in the series, the most runs scored in the series. The retirement of Michael Clarke following Australia's 3–2 defeat in the 2015 Ashes series saw Smith appointed as the full-time captain of the Australian Test team. Fellow New South Welshman David Warner was appointed as his vice-captain. "At 26, he is a fine young man with extraordinary talent, excellent leadership qualities and a terrific temperament." —former Australian cricketer Rod Marsh on Steve Smith. Next followed a three Test home series against New Zealand. Smith's output in the first Test in Brisbane was modest, scoring 48 and 1, as the team romped home for a win in a high scoring game. During the second Test, Smith scored 27 in the first innings before breaking the shackles with 138 in the second innings. This was Smith's first-ever second innings century, all previous centuries having been scored in the first innings of a Test match. Australia went on to draw the second Test. In the third Test, significant for being the first-ever day-night Test held at the Adelaide Oval, Smith defied difficult batting conditions to register 53 in the first innings, before falling for 14 in the second innings. Australia won the match in a tight contest. Shortly after the series against New Zealand, a three Test series was to be held against the West Indies. During the first innings of the first Test, Smith was caught behind on 10, and did not bat again, due to Australia's dominance. The second Test was successful for the captain, scoring 134* and 70* in each respective innings, as Australia went on to seal a series victory. Due to poor weather conditions, the third Test was a wash out, with very little play able to be held. A two Test return tour against New Zealand took place in February 2016. Smith looked to be in fine touch, registering 71, 138, and 53* in the three innings in which he batted, as the Australian team won 2–0. During the T20 World Cup 2016, held in India, Smith struggled with form early, before registering 61 against Pakistan in a must-win pool match for Australia. Smith went on to score only 2 against India, as Australia were knocked out of the tournament. It was believed that Smith was incorrectly given out, having clean missed a ball the umpires deemed to have been edged. Smith then led the Australian Cricket Team on their tour of Sri Lanka. The three Test series was a disaster for the Aussies, losing 3–0. Smith was Australia's highest run scorer in the series, scoring 247 runs at an average of 41, including one century and one fifty. Throughout the following ODI series, Smith averaged in excess of 40 across the first two matches, before leaving early for a rest. Australia's disappointing run of form continued into their ODI tour of South Africa. The lost the first 3 matches consecutively, largely attesting to their young bowling attack's inability to contain a strong South African batting line-up. Smith was disappointing in output across the first two ODIs, before scoring 108 off 107 balls in the 3rd match, as he and David Warner helped Australia to 371. Following the 5–0 ODI defeat in South Africa, the Australian team returned home for a 3 Test series against South Africa. In the first Test Smith made a duck and 34 runs, respectively, but made little impact and Australia lost the Test match. In the second Test at Hobart, Smith made 48 runs in the first innings but the team capitulated, only making a total score of 85 runs and ending up losing the Test. Following the defeat, criticism of Smith's captaincy and the team's performance emerged which saw the influx of young players such as Matt Renshaw, Peter Handscomb and Nic Maddison for the last Test. After losing five consecutive Tests, Smith made 59 and 40, respectively, with the addition of his team performances to win the day-night Test match in Adelaide. The win in Adelaide avoided a 3–0 whitewash at home, as the 2–1 defeat marked Smith's series defeat at home. After the Test series against South Africa, New Zealand played 3 ODIs in between the two Test series against South Africa and Pakistan. In the first ODI, Steve Smith registered 164 runs at the SCG, marking the highest ODI score at the ground, beating the previous score of 162 set by AB De Villiers during the 2015 World Cup. He was awarded "man of the match". In the second ODI he made 72 runs and in Melbourne of the final ODI he was dismissed for a duck. The Australian team won the contested Chappell-Hadlee Trophy 3–0 and returned the trophy to Australia. Pakistan was scheduled to have three Test series and 5 ODIs. In the first Test in Brisbane, Smith made 130 and 63 runs. His century in Brisbane marked his 16th Test century and his first against Pakistan. Despite Pakistan being bowled out for a low score of 142 in the first innings, Smith's captaincy tactics sparked a mixed response from critics when the on-field umpires made the decision to increase the fourth day evening session for another thirty minutes, believing a result would be determined. Pakistan made a 4th innings total of 450, as Australia won by 39 runs. The second Test match was held at the Melbourne Cricket Ground and Smith later placed his seventeenth century, the fourth-fastest to do so and also reaching 1000 runs in the calendar year—his third consecutive achievement of this since 2014. Despite intermittent rain, Australia managed an unlikely victory into the last session of day five, resulting in a 2–0 win for Australia. The final Test at the Sydney Cricket Ground marked Steve Smith's 50th Test match, as Australia whitewashed Pakistan 3–0 . Following the victory, he was awarded "Man of the Series" after making a total of 441 runs—the most in the series from both sides. Smith was once again featured in ICC's 2016 Cricket Awards as a 12th man for the ICC Test team of the year. In the ODI Series against Pakistan, Smith experienced mixed results but played a vital role, with Australia later ending up routing Pakistan 4–1. On 19 January 2017, Steve Smith produced his 8th ODI century against Pakistan at the WACA Ground—becoming the quickest Australian to reach 3000 ODI runs within 79 innings. Following the home series, Smith was scheduled to tour three ODI matches against New Zealand for the Chappell–Hadlee Trophy but later sustained a mild sprain to the medial ligament in his left ankle, so he headed to Dubai in preparation for the upcoming four Test tour of India. Following the training at ICC's Cricket Academy Centre in Dubai, Smith began the tour of India with a century in their maiden warm-up match in Mumbai. He replicated his ton in the first Test in Pune where he produced his first century in the Indian Subcontinent, accompanied by the support of his bowlers to win their first Test match in India since 2004 and breaking India's 19 match undefeated streak, stretching back from 2012. In the 3rd Test match in Ranchi, which is the first-ever Test match hosted at this venue, Steve Smith scored yet another century, 178*. This is the third-highest score by an Australian cricketer in Test matches played in India and the highest by an Australian Captain. In the fourth Test in Dharmasala, Smith scored 111 in the first innings which helped Australia to a first innings score of 300. In the second innings, Smith played a ball onto his stumps after scoring a rapid and threatening 17 runs off 15 balls. Smith was the highest run scorer in the series, scoring 499 runs at an average of 71.29, including three centuries. In the first test at Brisbane, Smith scored the first century of the series, 141*, which was his 21st Test century in his 105th innings—making him the third-quickest to score 21 test centuries behind Donald Bradman and Sunil Gavaskar. On 16 December 2017 Smith scored 239 on the final Ashes match at WACA Ground. He was quick to score his 22nd century at the WACA, before he converted that into a career-best 239. It was his second double-hundred and his first as captain. In the fourth Ashes test at Melbourne, Smith continued his prodigious form when he scored 76 in the first innings before he was bowled by England debutant Tom Curran, providing him with his first wicket in test cricket. A series best 244* by England's Alastair Cook then placed Australia in a tense situation that saw them trail by 164 at the start of the fourth day. Coming in at 2/65 before lunch on a rain affected day four, Smith batted until the closure of play on day five and scored yet another century, finishing with a defiant 102* from 275 deliveries to guide Australia to a draw and denying England of its first victory in Australia since 2011. Smith concluded the 2017 calendar year with six centuries and three fifties, along with an average of 76.76 and a total of 1,305 runs, the highest of any player that year. 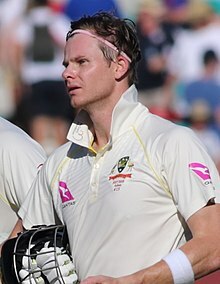 During the final Ashes match in Sydney, Smith reached the milestone of 6,000 Test runs in 111 innings, becoming the equal second-fastest player and also the youngest Australian, ever to do so. Smith garnered praise from opponent captain Joe Root for leading the team from the front, and in Root's opinion Smith was the difference between the two teams during 2017–18 Ashes series. Smith was the highest run scorer in the series, scoring 687 runs at an average of 137.40, including three centuries and two fifties. Smith was rested for the T20 series against New Zealand and England so he could prepare for the South African Tests. The series was marred by controversial incidents on and off field. Australia won the first Test by 118 runs with Smith making scores of 56 and 38 runs. The result was overshadowed by a stairwell confrontation between Australian vice captain David Warner and South African wicket-keeper Quinton de Kock. Footage emerged showing Warner having to be physically restrained after words were spoken between the two. This led to Smith and opposing captain Faf du Plessis being called to a meeting with umpires and match officials, where they were reminded of their responsibility to control their teams. South Africa won the second Test by 6 wickets, with Smith's contributions being only 25 and 11 runs. Smith's diminishing returns with the bat and lower than average strike rate suggested that he may have been struggling somewhat. During the match South African fast bowler and player of the match Kagiso Rabada was suspended for the following Test after he made physical contact with Smith after he dismissed him. Rabada successfully appealed the ban; a decision that annoyed Smith. Australia were beaten by 322 runs in the third Test, with Smith barely contributing to the score. However, the match result was overshadowed by illegal ball tampering that occurred on the third day. Cameron Bancroft, the second-youngest and most inexperienced member of the team, was captured by television cameras surreptitiously using sandpaper to rough up the cricket ball. He then hid the sandpaper in his underwear before being confronted by the on-field umpires. When attending the press conference at the conclusion of the third day's play with Bancroft, Smith admitted that the "leadership group" of the team discussed tampering with the ball to influence the result of the match during the lunch break. He admitted that he was part of the "leadership group" but did not identify the other members. Smith and vice-captain David Warner stood down from the team leadership the morning after the incident, but still played on, and wicketkeeper Tim Paine took over as interim captain for the rest of the Test match. Subsequently, match referee Andy Pycroft for the ICC banned Smith for one Test match and fined him 100% of his match fee. He handed Bancroft three demerit points and fined him 75% of his match fee. Cricket Australia launched an independent investigation, charging Smith with bringing the game into disrepute. He was suspended and sent home from the tour. The report stated that, while he did not develop the plan, Smith was found to have misled match officials and others, and as captain did not act to prevent it. He was therefore banned from all international and domestic cricket for 12 months, and is not to be considered for a leadership role for 12 months after that. Warner and Bancroft also received bans. Smith also had his contract with the Rajasthan Royals IPL team for the 2018 season terminated by the Board of Control for Cricket in India as a consequence of the sanctions. Smith arrived in Sydney later that day. In a press conference at Sydney Airport, a tearful Smith started by saying that he had nothing to add to Cricket Australia's report. He said that as captain of the Australian cricket team, he took full responsibility (even though he did not devise the plan to change the condition of the ball or actually perform the act), and that he had made a serious error in judgement: "It was a failure of leadership, my leadership." As well as apologising to his "teammates, to fans of cricket all over the world and to all Australians who are disappointed and angry", he specifically referred to the effect that the incident had had on his parents and implored others faced with questionable decisions to consider their parents. He added, "I know I will regret this for the rest of my life. I'm absolutely gutted. I hope in time I can earn back respect and forgiveness." In April 2019, he was named in Australia's squad for the 2019 Cricket World Cup. After missing 2018–19 season, Smith was awarded a national contract by Cricket Australia for the 2019–20 season. Smith is a right-handed batsman with a technique that has attracted attention for its unorthodoxy. He moves around frequently in the crease, especially during bowlers' run-up, and ends up with the toes of his feet outside off stump against right-handers, controls the bat with his bottom hand (that is, the hand closest to the blade of the bat), and is capable of playing unconventional cricket shots like the reverse sweep. Playing in a club match in January 2010, right-handed Smith took guard left-handed and hit a six. Due to his unorthodox style, Smith was initially labelled as a limited-overs batsman who might struggle in the longer form of the game, especially early in his career when he was vulnerable outside off stump. However, Smith compensates for his unique technique with outstanding hand-eye co-ordination, and his footwork, especially to spin bowlers, is exemplary. Smith spontaneously experimented with his technique during the Perth Test match in the 2013–14 Ashes, during which he decided to take a "preliminary back and across movement" to counter short-pitched bowling. This change has taken his batting average from 33 to 63.55 as it stands as of 2018. At the time of delivery, Smith's stumps are fully covered, making bowled dismissals unlikely. This position also allows him to play to either the on or off side with ease. Much of the credit for Smith's success can also be attributed to batting coach Trent Woodhill, who coached Smith as a junior and noted his abundant talent. He has also defended Smith's unique batting style, and has long argued that in Australia, many naturally talented cricketers who may not necessarily have an orthodox technique are let down by over-coaching; in the years between leaving school and his elevation into international cricket, Smith had his technique picked apart by a number of well-intentioned coaches. Since re-establishing his working relationship with Woodhill, Smith appears to have regained calm and confidence in his cricket, which has since produced results over the last few seasons. Smith is also known for his concentration, being able to bat for long periods of time, even through a whole day's play. As a bowler, however, after his quick rise up the batting order (until he became captain, and settled in at 4), the comparisons to Shane Warne never gathered momentum. He was an able option as a leg spinner early in his career, but was under-used because he was described as a very defensive bowler. In ODIs it becomes more apparent, as he will put himself on to bowl when others' economy rates are too high. He has already been tagged as the second "Captain Grumpy" since Allan Border early in his captaincy reign, having to warn Mitchell Starc for unsportsmanlike behaviour, and being highly critical of the team's bowling and fielding despite beating New Zealand by over 200 runs. Later, in 2017–2018, he publicly criticised Glenn Maxwell's training regimen when Maxwell was dropped from the Australian ODI squad. He has also been criticised for having too much influence over team selections. As of April 2018[update], Smith has scored 23 Test and eight ODI centuries. As of April 2018, Smith has made a total of 37 first-class centuries, ten List A centuries and one T20 century. His best bowling figures of 64/7 were taken for New South Wales against South Australia in the Sheffield Shield. Smith's highest score in Test and First-class is 239 scored against England at the WACA Ground, Perth in 2017. Highest score in ODI and List A is 164 scored against New Zealand at Sydney Cricket Ground, Sydney in 2016. Highest score in T20I is 90 scored against England at the Sophia Gardens, Cardiff in 2015. Highest score in T20 is 101 scored for Rising Pune Supergiants against Gujarat Lions at Maharashtra Cricket Association Stadium, Pune in the 2016 Indian Premier League. The second-highest Test batting rating of 947, only behind Don Bradman's 961 reached on 30 December 2017. Only player to win the ICC Test Player of the Year award more than once. Youngest player to win the Sir Garfield Sobers Trophy (ICC Cricketer of the Year award). Second youngest batsman to top the ICC Test batting rankings. Fastest Australian batsman and sixth-fastest batsman in the world to reach 10,000 runs in International cricket. Only the second batsman to score more than 1,000 runs in Test cricket in four consecutive calendar years. Joint second-fastest batsman to reach 6,000 runs in Tests only after Don Bradman. Youngest Australian batsman and fourth youngest in the world to reach 6000 runs in Test cricket. Fastest Australian batsman to reach 3,000 One Day International (ODI) runs. Fifth player to win the Allan Border Medal more than once. First cricketer to win the McGilvray Medal four times. Only the second batsman after Bradman to score four consecutive Test centuries in four matches at the Melbourne Cricket Ground, and lasted 1,093 days (or 455 runs) between two fallen wickets. During the 2018 Australian tour to South Africa, he equalled the joint world record for taking five catches as a non-wicketkeeper in a test innings and became the 11th overall fielder to achieve this feat. ^ Barrett, Chris (15 December 2014). "Steve Smith pushes through shyness to become Australia's 45th Test captain". The Sydney Morning Herald. Retrieved 18 December 2018. ^ "Steve Smith". cricket.com.au. Cricket Australia. Retrieved 15 January 2014. "Ashes: Is Steve Smith the best since Donald Bradman?". BBC Sport. 16 December 2017. Retrieved 10 January 2019. "Joe Root? Virat Kohli? Steve Smith? Who is the best batsman in the world?". BBC Sport. 13 September 2018. Retrieved 10 January 2019. "Steven Smith's glorious four-year run". ESPNcricinfo. 16 December 2017. Retrieved 10 July 2018. ^ "Test cricket's young Fab Four". ESPNcricinfo. 29 August 2014. Retrieved 10 January 2019. ^ Barrett, Chris (15 December 2014). "Steve Smith goes from teenage club sensation to Australian cricket captain". The Sydney Morning Herald. Retrieved 26 January 2015. ^ Bull, Andy (9 May 2010). "Steve Smith spins from England's grasp to boost Australia's attack". The Guardian. Retrieved 24 March 2011. ^ Hooper, James (11 January 2010). "Young leg-spin tyro Steven Smith sets his sights on Test cricket heights". Herald Sun. Retrieved 26 January 2015. ^ a b c Brettig, Daniel (18 November 2013). "Learning on the job". Cricinfo Magazine. Retrieved 26 January 2015. ^ "Steve Smith almost played cricket for England". news.com. 20 November 2017. Retrieved 29 April 2018. ^ Webster, Andrew (16 December 2014). "How love turned Steve Smith from cricket tragic to Australian Test captain". The Sydney Morning Herald. Retrieved 26 January 2015. ^ "Australian cricket captain Steve Smith announces engagement to Dani Willis". news.com.au. News Corp Australia. 29 June 2017. ^ "Smith, Willis marry in Southern Highlands". cricket.com.au. Cricket Australia. 16 September 2018. ^ "Statistics batting". ESPNcricinfo. Retrieved 29 June 2018. ^ "Statistics bowling". ESPNcricinfo. Retrieved 29 June 2018. ^ "Scorecard: New South Wales v Trinidad and Tobago at Hyderabad, 23 October 2009". CricketArchive. Retrieved 13 January 2015. ^ Hogan, Jesse (28 December 2009). "Is that your real heir, Warnie?". The Sydney Morning Herald. Retrieved 14 January 2015. ^ "Scorecard: New South Wales v. South Australia at Sydney, 10–12 March 2010". ESPNcricinfo. Retrieved 14 January 2015. ^ "Scorecard: South Australia v New South Wales at Adelaide, 1 January 2008". ESPNcricinfo. Retrieved 11 January 2015. ^ a b c "Steven Smith". ESPNcricinfo. Retrieved 2 January 2018. ^ "Katich crowned Pura Cup Player of the Year". ESPNcricinfo. 13 March 2008. Retrieved 13 March 2008. ^ "Sixers smash Scorchers to win BBL". Sports News First. 28 January 2012. Archived from the original on 12 May 2012. Retrieved 9 August 2013. ^ Bayliss, Trevor (6 June 2012). "Steven Smith – Sydney Sixers – Big Bash League". Sydney Sixers. Archived from the original on 28 June 2013. Retrieved 9 August 2013. ^ "Rising all-rounder Steven Smith has become the latest Australian to join the Indian Premier League by signing a rich deal with Bangalore". The Daily Telegraph. Sydney. 12 February 2010. Retrieved 6 April 2012. ^ IPL auction, Day 1: Who got whom. The Times of India (8 January 201). Retrieved on 26 May 2018. ^ IPL 5: Steven Smith replaces Mitchell Marsh in Pune Warriors squad – Sports. Post.jagran.com (10 March 2012). Retrieved on 26 May 2018. ^ 3rd match (D/N), Indian Premier League at Mumbai, Apr 6 2012 | Match Summary. ESPNCricinfo (6 April 2012). Retrieved on 26 May 2018. ^ a b "Kohli the highest-paid cricketer in IPL". ESPNcricinfo. 1 January 2016. Retrieved 5 January 2017. ^ "IPL franchises allowed to retain up to five players". ESPNcricinfo. 24 December 2013. Retrieved 5 January 2017. ^ "Match Report M25 RPS v GL". Archived from the original on 2 May 2016. Retrieved 9 May 2016. ^ "Match Report M29 RPS v MI". IPL. Archived from the original on 13 March 2017. Retrieved 5 January 2017. ^ "Final (N), Indian Premier League at Hyderabad, May 21 2017 – Match Summary – ESPNCricinfo". ESPNcricinfo. ^ "Most runs in 2017 season of Indian Premier League". www.iplt20.com. Retrieved 23 March 2019. ^ "Steve Smith named Rajasthan Royals captain". Retrieved 24 February 2018. ^ "Steve Smith stood down as Rajasthan Royals skipper following ball tampering scandal". news.com.au. 26 March 2018. Retrieved 26 March 2018. ^ "Steve Smith finds himself guilty conscious and resigned from the captaincy post for RR". Sky Sports. Retrieved 26 March 2018. ^ "IPL tear up $2.4m Warner, Smith deals". Retrieved 28 March 2018. ^ "Warner and Smith axed from IPL 2018". ESPNcricinfo. Retrieved 30 March 2018. ^ "Steve Smith and David Warner banned from IPL 2018 by BCCI over ball-tampering scandal- Firstcricket News, Firstpost". FirstCricket. Retrieved 30 March 2018. ^ Gray, James (28 March 2018). "IPL 2018: Steve Smith and David Warner OUT of competition for ball-tampering in HUGE blow". Daily Express. Retrieved 30 March 2018. ^ Acharya, Shayan. "IPL: Rajasthan Royals retains Steve Smith". Sportstar. Retrieved 20 January 2019. ^ "IPL 2019: Full list of retained players by Rajasthan Royals and their salary". www.sportskeeda.com. 28 November 2018. Retrieved 20 January 2019. ^ "IPL 2019: Rajasthan Royals retain 16 players including Steve Smith". Big News Network.com. Retrieved 20 January 2019. ^ "Smith takes over from Rahane as Rajasthan Royals captain". www.icc-cricket.com. Retrieved 20 April 2019. ^ "Smith replaces Rahane as captain as Royals look for 'fresh approach'". ESPNcricinfo. 20 April 2019. Retrieved 20 April 2019. ^ Della Penna, Peter (24 May 2018) Steven Smith named as marquee player for Canada T20 tournament. Espncricinfo.com. Retrieved on 26 May 2018. ^ Devine, Christopher (16 May 2018) Steve Smith named as marquee player for Global T20 Canada. Sportingnews.com. Retrieved on 26 May 2018. ^ "Global T20 Canada: Complete Squads". SportsKeeda. 4 June 2018. Retrieved 4 June 2018. ^ "Global T20 Canada League – Full Squads announced". CricTracker. 4 June 2018. Retrieved 4 June 2018. ^ "Smith amongst the runs in T20 return". cricket.com.au. Retrieved 29 June 2018. ^ "Scorecard Toronto Nationals Vs Vancouver Knights". ESPNcricinfo. Retrieved 29 June 2018. ^ "Statistics>Most runs-GT20Canada". ESPNcricinfo. 11 July 2018. Retrieved 11 July 2018. ^ "Steve Smith joins Barbados Tridents for CPL 2018". www.icc-cricket.com. Retrieved 24 January 2019. ^ "STEVE SMITH TO JOIN BARBADOS TRIDENTS FOR 2018 HERO CPL CPL T20". www.cplt20.com. Retrieved 24 January 2019. ^ "David Warner & Steve Smith: Banned duo make club cricket return in Australia". BBC Sport. 22 September 2018. Retrieved 21 October 2018. ^ "PSL 4 Draft - Auction Categories and Players List". Pakistan Super League Draft. 30 September 2018. Retrieved 5 October 2018. ^ "Smith set for Pakistan Super League". ^ Bilal, Mohammad Abubakar (4 October 2018). "Steve Smith, AB de Villiers headline star-studded PSL 2019 Platinum category". ^ "BCB changes rules to let Steven Smith play in the BPL". ESPNcricinfo. 27 December 2018. Retrieved 20 January 2019. ^ "Steven Smith joins Comilla Victorians for BPL 2019". ESPNcricinfo. 27 November 2018. Retrieved 20 January 2019. ^ "Steven Smith international return date in doubt due to elbow surgery". ESPNcricinfo. 12 January 2019. Retrieved 20 January 2019. ^ "Steve Smith comeback to be delayed by elbow surgery". BBC Sport. 12 January 2019. Retrieved 20 January 2019. ^ "Scorecard: 1st Test: Australia v. Pakistan at Lord's, 13–16 July 2010". ESPNcricinfo. Retrieved 13 January 2015. ^ "Scorecard: 2nd Test: Australia v. Pakistan at Headingly, 21–24 July 2010". ESPNcricinfo. Retrieved 13 January 2015. ^ "Super leg-spinner catches the eye". The Daily Telegraph. Sydney. 24 February 2010. Retrieved 9 August 2013. ^ "Steven Smith's lucky break". ESPNcricinfo. 14 March 2013. Retrieved 29 March 2018. ^ "Steven Smith's lucky break". ESPNcricinfo. 14 March 2013. Retrieved 24 December 2016. ^ Bryant, Nick (13 March 2013). "Australia cricket: 'Homework failure' sparks debate". BBC News. Retrieved 24 December 2016. ^ "Watson leaves tour after Australia axe four". ESPNcricinfo. 11 March 2013. Retrieved 24 December 2016. ^ "Frown Under: Dressing room unrest leaves Australia in turmoil". Daily Mirror. 11 March 2013. Retrieved 24 December 2016. ^ "Results – India v Australia – ESPNcricinfo". Cricinfo. ^ "Smith lifts Australians after top-order trouble". ESPNcricinfo. 14 June 2013. Retrieved 24 December 2016. ^ "Ashes 2013: Australia add Steve Smith to squad". BBC Sport. 23 June 2013. Retrieved 24 December 2016. ^ "Taylor and Bird make Test auditions". ESPNcricinfo. 27 July 2013. Retrieved 24 December 2016. ^ Staff, Guardian (August 2013). "Ashes 2013: Umpire howler in third Test leaves Australia furious". The Guardian. Retrieved 24 December 2016. ^ "The Ashes 2013: DRS flashpoints and controversial umpire decisions". ABC News. 2 August 2013. Retrieved 24 December 2016. ^ Higginson, Marc; Mitchener, Mark (22 August 2013). "England v Australia fifth Test day two as it happened". BBC Sport. Archived from the original on 14 January 2015. Retrieved 14 January 2015. ^ Coverdale, Brydon (12 November 2013). "Bailey named in Test squad". ESPNcricinfo. Retrieved 24 December 2016. ^ "The Ashes: Steven Smith rescues Australia with century to edge England on day one of third Test". ABC News. 13 December 2013. Retrieved 24 December 2016. ^ "Smith stands up with hugely significant innings". ESPNcricinfo. 13 December 2013. Retrieved 24 December 2016. ^ "The Ashes: Brad Haddin, Steve Smith rescue Australia's innings in fifth Test at SCG". ABC News. 3 January 2014. Retrieved 24 December 2016. ^ "The Ashes: Australia completes series whitewash with fifth Test win at SCG". ABC News. 5 January 2014. Retrieved 24 December 2016. ^ "Centuries by Steve Smith and Shaun Marsh mean no Brad Haddin rescue mission needed". The Daily Telegraph. Sydney: News Corp Australia. 13 February 2014. Retrieved 24 December 2016. ^ "Mitchell Johnson takes 12 wickets as Australia beats South Africa in first Test in Centurion". ABC News. 15 February 2014. Retrieved 24 December 2016. ^ "Australia beats South Africa by 245 runs to win third Test in Cape Town, clinches series 2–1". Fox Sports. 5 March 2014. Retrieved 24 December 2016. ^ "Lyon back in Australia's ODI squad". ESPNcricinfo. 4 August 2014. Retrieved 24 December 2016. ^ "Smith ton sets up big Australia win". ESPNcricinfo. 7 October 2014. Retrieved 24 December 2016. ^ "Why Smith's catch to dismiss Fawad was allowed". ESPNcricinfo. 13 October 2014. Retrieved 25 December 2016. ^ "Steven Smith's controversial catch to dismiss Fawad Alam: A frame-by-frame analysis". cricketcountry.com. India Webportal. Retrieved 25 December 2016. ^ "Australia turn tables for one-run win". ESPNcricinfo. 12 October 2014. Retrieved 25 December 2016. ^ "Australians done by spin, reverse swing". ESPNcricinfo. 18 October 2014. Retrieved 25 December 2016. ^ "Pakistan complete 2–0 series sweep". cricket.com.au. Cricket Australia. Retrieved 25 December 2016. ^ "Australia look to keep momentum in Clarke's absence". ESPNcricinfo. 15 November 2014. Retrieved 25 December 2016. ^ "South Africa in Australia ODI Series, 2014/15 Cricket Team Records & Stats (Most runs)". ESPNcricinfo. Retrieved 22 March 2019. ^ "Border-Gavaskar Trophy, 2014/15". ESPNcricinfo. Retrieved 3 September 2014. ^ "First Test to honour Phillip Hughes". cricket.com.au. Cricket Australia. Retrieved 25 December 2016. ^ "Smith to captain Australia for Test series against India". Retrieved 28 March 2018. ^ "CA announce Australia Test team leadership changes". Cricket Australia. 15 December 2014. Retrieved 19 December 2014. ^ "Australia v India: Steve Smith scores 192 at MCG, six amazing statistics". Fox Sports. 27 December 2014. Retrieved 14 January 2015. ^ Coverdale, Brydon (7 January 2015). "Australia on top after making 572". ESPNcricinfo. Retrieved 5 January 2017. ^ "Skipper Smith joins all-time greats". cricket.com.au. Cricket Australia. Retrieved 25 December 2016. ^ "Steve Smith surpasses Don Bradman's record in Sydney Test; becomes highest Australian run-getter in Test series against India". DNA India. 9 January 2015. Retrieved 14 January 2015. ^ Middleton, Dave. "Smith to skipper as White and Marsh added to ODI squad". cricket.com.au. Cricket Australia. Retrieved 26 December 2016. ^ Coverdale, Brydon (23 January 2015). "Smith ton leads Australia to final". ESPNcricinfo. ^ Marks, Vic (26 March 2015). "Steve Smith century helps Australia crush India to reach World Cup final". The Guardian. Retrieved 26 December 2016. ^ Lynch, Steven (30 April 2016). "Australia v New Zealand". Wisden Cricketers' Almanack. Retrieved 26 December 2016 – via ESPNcricinfo. ^ "ICC Cricket World Cup, 2014/15 Most runs". ESPNcricinfo. Retrieved 3 March 2019. ^ Buckle, Greg (12 June 2015). "West Indies v Australia: Steve Smith 199 sees him join unwanted exclusive club". Fox Sports. Retrieved 30 December 2016. ^ Binoy, George (14 June 2015). "Australia complete 277-run demolition". ESPNcricinfo. Retrieved 30 December 2016. ^ "Smith's numbers up there with best ever". cricket.com.au. Cricket Australia. 16 June 2015. Retrieved 18 June 2015. ^ Hussain, Nasser (8 July 2015). "Joe Root v Steve Smith: Ashes 2015 stars assessed by Nasser Hussain". skysports.com. Retrieved 30 December 2016. ^ MacGill, Stuart (8 July 2015). "The Ashes 2015: England's Joe Root and Australia's Steve Smith will determine Ashes, says MacGill". Fox Sports. Retrieved 30 December 2016. ^ Brettig, Daniel (26 June 2015). "Confident Smith limbers up for Ashes". ESPNcricinfo. Retrieved 30 December 2016. ^ "Ashes 2015: Steve Smith hits 11th Test ton thanks to Steven Finn no-ball". Fox Sports. 18 July 2015. Retrieved 30 December 2016. ^ Barrett, Chris (18 July 2015). "Ashes 2015: Steve Smith scores double century nine years after visit to Lord's as teen". The Sydney Morning Herald. Retrieved 30 December 2016. ^ Dawkes, Phil (6 August 2016). "Ashes 2015: Stuart Broad takes 8–15 as England eye Ashes win". BBC Sport. Retrieved 30 December 2016. ^ "Ashes 2015: Australian Test greats Shane Warne and Ricky Ponting blast Steve Smith for throwing his wicket away on day two at Trent Bridge". ABC News. 8 August 2015. Retrieved 30 December 2016. ^ "Ashes 2015: Geoffrey Boycott leads English media's dismantling of Australia". Fox Sports. 8 August 2015. Retrieved 30 December 2016. ^ Hopps, David (21 August 2015). "Feeble England collapse after Smith ton". ESPNcricinfo. Retrieved 30 December 2016. ^ Middleton, Dave (9 September 2015). "Haddin announces Test retirement". cricket.com.au. Cricket Australia. Retrieved 30 December 2016. ^ "The Ashes, 2015 Cricket Team Records & Stats". ESPNcricinfo. Retrieved 3 March 2019. ^ "List of Test Captains". ESPNcricinfo. Retrieved 26 March 2018. ^ "List of ODI Captains". ESPNcricinfo. Retrieved 28 January 2018. ^ "List of Twenty20 Captains". ESPNcricinfo. Retrieved 2 September 2015. ^ a b "Smith named as Australia's new cricket captain". Al Jazeera. Reuters. 15 August 2015. Retrieved 15 August 2016. ^ "Steven Smith appointed Australia's next Test captain, David Warner his deputy". cricketaustralia.com.au (Press release). Cricket Australia. 14 August 2015. Retrieved 20 September 2015. ^ Ramsey, Andrew (9 November 2015) Australia cruise to Gabba victory. cricket.com.au. Retrieved on 26 May 2018. ^ Lemon, Geoff (29 November 2015). "Australia beats New Zealand in day-night test to win series 2–0". ABC News. ^ "Commonwealth Bank Test Series v West Indies: 10 December 2015 – 7 January 2016". Cricket Australia. Retrieved 5 January 2017. ^ Results | New Zealand v Australia. ESPNcricinfo. Retrieved on 26 May 2018. ^ Ferris, Sam (28 March 2016) Kohli masterclass knocks Australia out of World T20. Cricket.com.au. Retrieved on 26 May 2018. ^ Pinshaw, Antony (28 March 2016) World Twenty20: Two blunders that cost Steve Smith dearly in Australia’s loss to India. Fox Sports via Herald Sun. ^ Ramsey, Andrew (18 August 2016). "Sri Lanka spin way to clean sweep". Cricket Australia. ^ Buckle, Greg (25 August 2016). "Steve Smith to come home after Australia's loss to Sri Lanka in second ODI". Herald Sun. Retrieved 8 September 2016. ^ "ODI losses bring valuable Test lessons". Cricket Australia. 9 October 2016. Retrieved 9 October 2016. ^ "South Africa v Australia: Coverage of the third ODI". Fox Sports. 5 October 2016. Retrieved 9 October 2016. ^ "Australia v South Africa: Hosts collapse for innings and 80-run defeat on day four, Proteas win series". ABC News. 15 November 2016. Retrieved 24 December 2016. ^ "Spectacular Smith smashes SCG record". cricket.com.au. Cricket Australia. Retrieved 24 December 2016. ^ "Warner 156 sets up Australia's 3–0 sweep". ESPNcricinfo. Retrieved 24 December 2016. ^ "Umpires solely responsible for controversial final session at the Gabba". Fox Sports. 19 December 2016. Retrieved 24 December 2016. ^ "Steve Smith's captaincy condemned by Test greats Michael Vaughan, Mark Taylor and Michael Clarke". The Daily Telegraph. Sydney: News Corp Australia. 19 December 2016. Retrieved 24 December 2016. ^ "Allan Border, Mark Waugh defend Smith's captaincy and tactics at the Gabba". Fox Sports. 21 December 2016. Retrieved 24 December 2016. ^ Ramsey, Michael. "Smith leads from the front with MCG ton". Nine's Wide World of Sports. Nine Digital. Retrieved 30 December 2016. ^ Seevri, Bharath (29 December 2016). "Smith's affair with the Boxing Day Test". ESPNcricinfo. ^ Ramsey, Andrew (30 December 2016). "Australia wrap up Boxing Day miracle". cricket.com.au. Cricket Australia. ^ Ramsey, Andrew (7 January 2016). "Smith's Australians secure clean sweep". cricket.com.au. Cricket Australia. Retrieved 7 January 2016. ^ "ICC Test and ODI Teams of the Year announced". ICC Cricket (Press release). International Cricket Council. Archived from the original on 24 December 2016. Retrieved 24 December 2016. ^ Smith, Martin (19 January 2017). "Superb Smith breaks another record". cricket.com.au. Cricket Australia. Retrieved 19 January 2017. ^ Ramsey, Andrew (27 January 2017). "Skipper Smith ruled out of NZ tour". cricket.com.au. Cricket Australia. Retrieved 28 January 2017. ^ Coverdale, Brydon (25 February 2017). "O'Keefe, Smith set up famous Australia victory". ESPNcricinfo. Retrieved 25 February 2017. ^ Ramsey, Andrew (25 February 2017). "Australia spin way to massive victory". cricket.com.au. Cricket Australia. Retrieved 25 February 2017. ^ "Steve Smith shatters records with epic 178 not out versus India in Ranchi Test". Hindustan Times. 17 March 2017. Retrieved 18 March 2017. ^ Cricket scorecard – India vs Australia, 4th Test, Australia Test tour of India, 2017. Cricbuzz.com. Retrieved on 26 May 2018. ^ "Border-Gavaskar Trophy, 2016/17 Cricket Team Records & Stats (Most runs)". ESPNcricinfo. Retrieved 23 March 2019. ^ "Smith's slow route to century No. 21". ESPNcricinfo. 25 November 2017. Retrieved 11 March 2019. ^ a b "Records – Test matches – Batting records – Fastest to 6000 runs – ESPNcricinfo". Retrieved 28 March 2018. ^ a b "Stats: Youngest cricketer to score 6000 Test runs – CricTracker". crictracker.com. Retrieved 28 March 2018. ^ "Joe Root- Australia Captain Steve Smith has shown me how you have to lead from the front". The Telegraph. Retrieved 5 January 2017. ^ "pink-hat-green-eyes-england". The Mirror. Retrieved 5 January 2017. ^ "The Ashes, 2017/18 >>Most runs". ESPNcricinfo. Retrieved 31 December 2018. ^ "Jhye Richardson in for SA Tests, no room for Maxwell, Sayers". ESPNcricinfo. Retrieved 26 March 2018. ^ "1st Test, Australia tour of South Africa at Durban, Mar 1–5 2018 | Match Report | ESPNCricinfo". ESPNcricinfo. Retrieved 26 March 2018. ^ "1st Test, Australia tour of South Africa at Durban, Mar 1–5 2018 | Match Summary | ESPNCricinfo". ESPNcricinfo. Retrieved 26 March 2018. ^ "Australia, South Africa point finger at the other over stairwell incident". ESPNcricinfo. Retrieved 26 March 2018. ^ "Control your teams, Smith and du Plessis told". ESPNcricinfo. Retrieved 26 March 2018. ^ "2nd Test, Australia tour of South Africa at Port Elizabeth, Mar 9–12 2018 | Match Summary | ESPNCricinfo". ESPNcricinfo. Retrieved 26 March 2018. ^ "Smith's decreasing returns leave Australia vulnerable". ESPNcricinfo. Retrieved 26 March 2018. ^ Moonda, Firdose (12 March 2018). "Rabada handed two-Test suspension". ESPNcricinfo. ^ Collins, Adam (21 March 2018). "'Pretty interesting': Steve Smith hits out at Kagiso Rabada appeal process". The Guardian. Retrieved 26 March 2018. ^ "3rd Test, Australia tour of South Africa at Cape Town, Mar 22–25 2018 | Match Summary | ESPNCricinfo". ESPNcricinfo. Retrieved 26 March 2018. ^ "Desperation drove Australia to cheat – Smith". ESPNcricinfo. 24 March 2018. Retrieved 26 March 2018. ^ "Cameron Bancroft: Australia player admits to ball-tampering, Steve Smith knew in advance". BBC Sport. 24 March 2018. Retrieved 27 March 2018. ^ Ferris, Sam (28 March 2018) Tampering trio learn their fate. Cricket.com.au. Retrieved on 26 May 2018. ^ Ferris, Sam (29 March 2018) Emotional Smith breaks down at press conference. Cricket.com.au. Retrieved on 26 May 2018. ^ "'I'm absolutely gutted': Distraught Smith apologises for ball-tampering scandal". abc.net.au. 29 March 2018. ^ "Tearful Steve Smith Takes Responsibility & Says: I Hope I Can Earn Forgiveness". wisden.com8. 29 March 2018. ^ "Smith and Warner make World Cup return; Handscomb and Hazlewood out". ESPN Cricinfo. 15 April 2019. Retrieved 15 April 2019. ^ "Australia contracts: Smith, Warner, Pattinson return; Mitch Marsh out". www.icc-cricket.com. Retrieved 15 April 2019. ^ "Pattinson, Warner, Smith handed central contracts; Mitchell Marsh dropped". ESPNcricinfo. 15 April 2019. Retrieved 15 April 2019. ^ a b c Chopra, Aakash (4 January 2015). "What can India do against Steven Smith?". Cricinfo Magazine. ^ Swanton, Will (22 January 2010). "Time to limit the amount of one-dayers and give Twenty20 more of a bash". The Sydney Morning Herald. Retrieved 9 August 2013. ^ "Smith takes us through his technique". cricket.com.au. 7 January 2017. Retrieved 3 January 2018. ^ Decoding Steve Smith's unique technique that has befuddled cricketing world – Firstcricket News, Firstpost. Firstpost.com (17 December 2017). Retrieved on 26 May 2018. ^ Joshi, Gaurav (29 June 2015) The transformation of Steven Smith | Cricket. ESPNcricinfo. Retrieved on 26 May 2018. ^ Kimber, Jarrod (19 December 2014). "The evolution of Steven Smith". ESPNcricinfo. ^ "Smith confirms batting order reshuffle". cricket.com.au. Retrieved 18 November 2015. ^ Mallett, Ashley (3 September 2013). "A modern-day Benaud?". ESPNcricinfo. Retrieved 5 January 2017. ^ Warne, Shane (14 July 2010) Shane Warne: Australian leg-spinner Steve Smith has chance to show he has the X-factor. Telegraph.co.uk. Retrieved on 26 May 2018. ^ "Smith laughs off 'grumpy' tag". ESPNcricinfo. Retrieved 13 November 2015. ^ "Smith's strong advice for axed Maxwell". cricket.com.au. Retrieved 4 January 2018. ^ "Steve Smith slammed for 'picking his bloody mates'". NewsComAu. Retrieved 4 January 2018. ^ Bull A (2010) Steve Smith spins from England's grasp to boost Australia's attack, The Guardian, 8 May 2010. Retrieved 2 April 2018. ^ "AUS 561/6 (156.5 ov, TD Paine 1*, MA Starc 1*, JM Anderson 2/92) – Live | Match Summary | ESPNcricinfo". ESPNcricinfo. Retrieved 17 December 2017. ^ "New Zealand tour of Australia, 1st ODI: Australia v NZ at Sydney, Dec 4, 2016". ESPNcricinfo. 4 December 2016. Retrieved 4 December 2016. ^ "Australia tour of England and Ireland, 2015 – England v Australia Scorecard". ESPNcricinfo. 31 August 2015. Retrieved 31 August 2015. ^ Marcuson J (2016) Steve Smith scores maiden Twenty20 ton, The Sydney Morning Herald, 30 April 2016. Retrieved 2 April 2018. ^ "Indian Premier League: Rising Pune Supergiants v Gujarat Lions at Pune, Apr 29, 2016". ESPNcricinfo. 29 April 2016. Retrieved 30 April 2016. ^ "Steve Smith World Cup match list". ESPNcricinfo. Retrieved 30 March 2015. ^ "Reliance ICC Best-Ever Test Championship Rating". Reliance ICC Rankings. Retrieved 8 August 2015. ^ "Live Cricket Scores & News International Cricket Council". www.icc-cricket.com. Retrieved 9 March 2019. ^ "Steven Smith becomes second youngest player to top batting charts". www.icc-cricket.com. Retrieved 9 March 2019. ^ "Steve Smith joins Virat Kohli, Joe Root on reaching 10000 international runs milestone". timesnownews.com. Retrieved 28 March 2018. ^ "Stats: Fastest players to complete 10000 runs in International cricket". 3 March 2018. Archived from the original on 4 March 2018. Retrieved 28 March 2018. ^ "Hayden's grand record within Smith's reach – cricket.com.au". www.cricket.com.au. ^ Rajesh, S. (16 December 2017) Steven Smith's glorious four-year run. Espncricinfo.com. Retrieved on 26 May 2018. ^ "Records – One-Day Internationals – Batting records – Fastest to 3000 runs – ESPNcricinfo". Retrieved 28 March 2018. ^ "Superb Smith breaks another record – cricket.com.au". cricket.com.au. Retrieved 28 March 2018. ^ "Australia captain Smith wins second Allan Border medal". Reuters. 12 February 2018. ^ The Ashes: Steve Smith wins McGilvray Medal for Australia's Test cricketer of the year for fourth time – Sport. ABC News (Australian Broadcasting Corporation) (6 January 2018). Retrieved on 26 May 2018. ^ "Smith makes more history in MCG knock". Retrieved 30 December 2017. ^ "Steve Smith joins elite club for taking 5 test catches in a single test innings". CricketAustralia. Retrieved 23 March 2018. ^ a b c d "Steven Smith claims top ICC awards". ESPNcricinfo. 23 December 2015. Retrieved 28 December 2015. ^ "Steve Smith named world's premier Test player". www.icc-cricket.com. Retrieved 4 January 2019. ^ "Smith collects first Allan Border Medal". cricket.com.au. Retrieved 31 December 2018. ^ a b c "Smith, Warner win big on Allan Border medal night". ESPNcricinfo. 12 February 2018. Retrieved 9 July 2018. ^ "Smith wins Compton-Miller Medal". cricket.com.au. Retrieved 31 December 2018. ^ "Awards – Cricket NSW". cricketnsw.com.au. Retrieved 28 March 2018. ^ Brettig, Daniel (4 May 2016). "Steven Smith – Wisden Cricketers of the Year 2015". ESPNcricinfo. Archived from the original on 7 August 2017. Retrieved 30 December 2017. ^ Martin, Ali (13 April 2016). "Wisden 2016: Stokes, Bairstow, Smith, McCullum and Williamson are players of the year". The Guardian. London. Archived from the original on 7 August 2017. Retrieved 30 December 2017. ^ "Australia v India, 2014/15 Series". ESPNcricinfo. 10 January 2015. Retrieved 14 January 2015. ^ "Australia v Pakistan, 2016/17 Series". ESPNcricinfo. 7 January 2017. Retrieved 7 January 2017. ^ "Australia v England, 2017/18 Series". ESPNcricinfo. 8 January 2018. Retrieved 8 January 2018. ^ "Player of the match awards in Test matches". ESPNCricinfo. Retrieved 7 March 2019. ^ "Pakistan v Australia, 2014/15 Series". ESPNcricinfo. 12 October 2014. Retrieved 18 January 2015. ^ "South Africa in Australia ODI Series, 2014/15 Series". ESPNcricinfo. 23 November 2014. Retrieved 19 January 2015. ^ "Player of the match awards in One day Internationals". ESPNcricinfo. Retrieved 7 March 2019. ^ "Player of the match awards in Twenty20 Internationals". ESPNcricinfo. Retrieved 7 March 2019. Smith, Steve (2017). The Journey: My story, from backyard cricket to Australian Captain. Australia: Allen & Unwin. ISBN 9781760639754. Wikimedia Commons has media related to Steve Smith (cricketer).